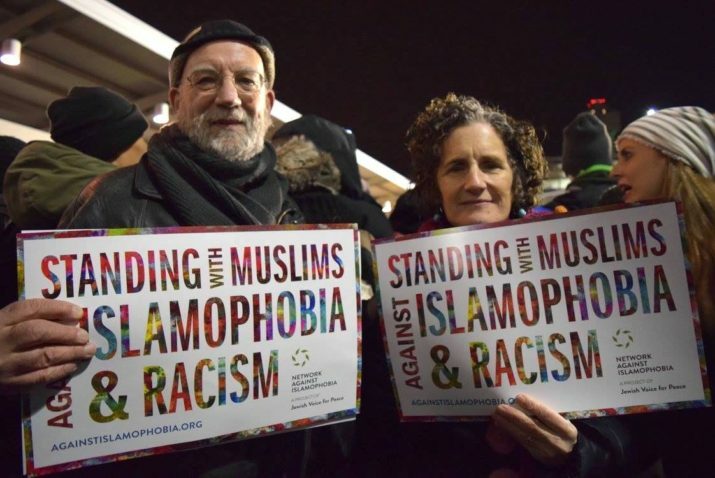 Two protestors at JFK International Airport with signs reading "Standing with Muslims Against Islamophobia and Racism". At San Francisco International Airport, a sign rises above the crowd of protestors reading “Refugees Are Welcome Here”. Two protestors at JFK International Airport with signs reading “Standing with Muslims Against Islamophobia and Racism”. 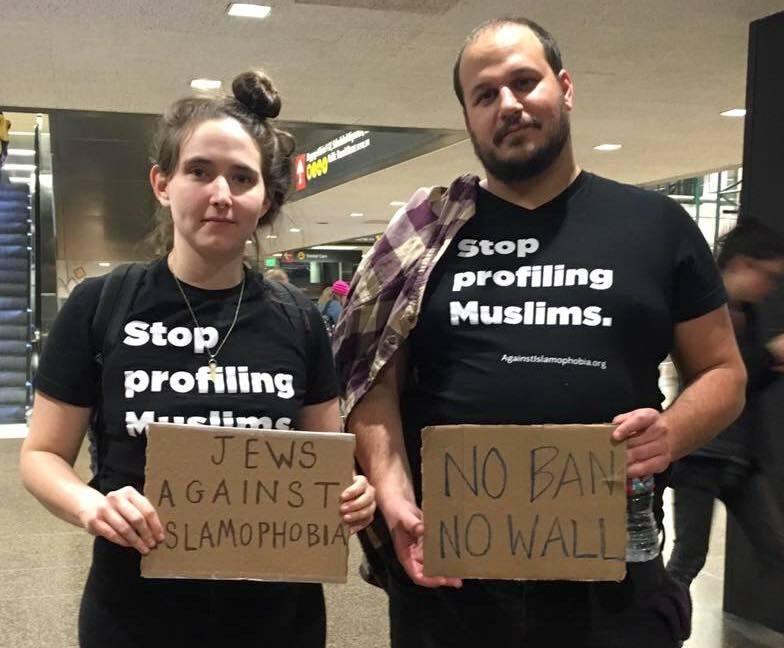 Two JVP members in SeaTac wearing shirts that read “Stop Profiling Muslims”. 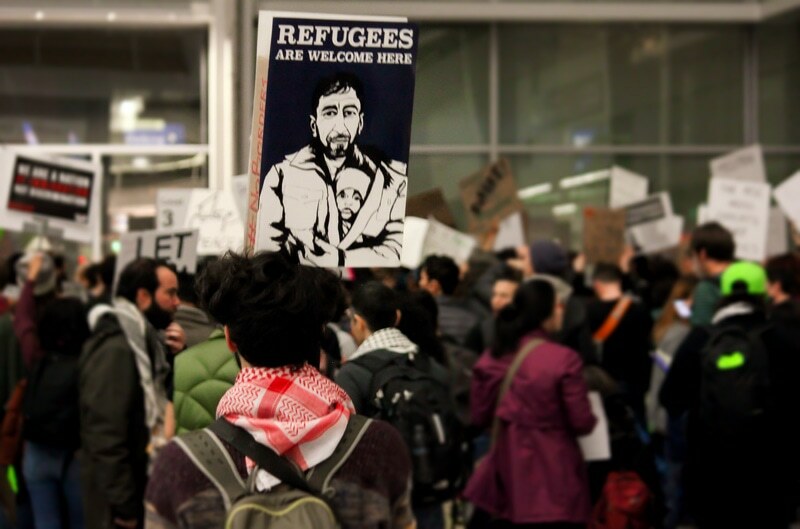 JVP members and thousands of protestors flooded airports across the U.S. after President Donald Trump signed an executive order temporarily banning all refugees from entering the country, and barring access for 90 days to nationals from seven majority-Muslim nations. Trump’s islamophobic order (you can read the full text here) instantly cut off access to the U.S. to 218 million people from Iran, Iraq, Libya, Somalia, Sudan, Syria and Yemen, and indefinitely suspended the admission of Syrian refugees. The order went into immediate effect, leading to hundreds of travelers & asylum seekers detained and deported upon landing to the U.S.
As a result of the immediate action of the protestors across the country, many travelers have been released and a federal judge issued an emergency stay for those who have already arrived. It was an incredible victory of people-power coming together and winning a high-stakes battle against Trump’s racism. But we know that the work is far from over. As Trump doubles down on targeting Muslims, Arabs, refugees, and immigrants, we pledge to resist in every way possible. 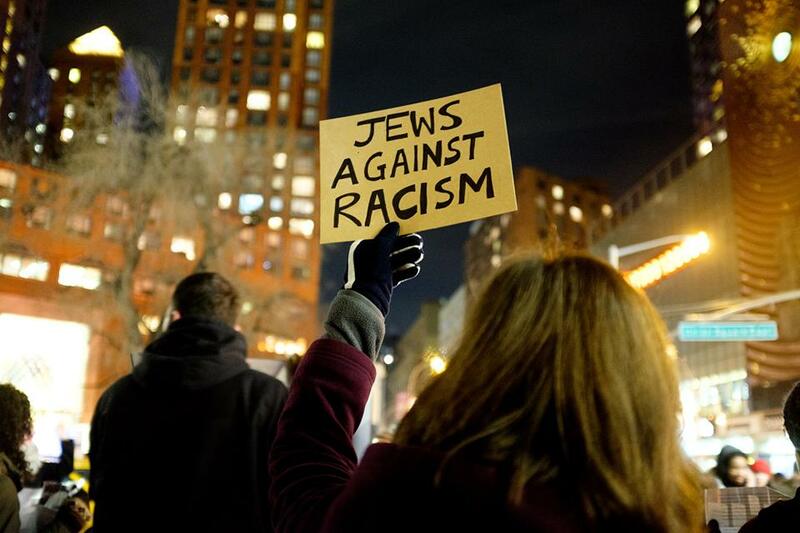 We’ll put our hearts, souls, and bodies on the line to stop these hateful and racist attacks. We all belong here. We will love, defend, and protect one and another. Trump’s executive order is piled on top of his promise to build even more of a wall on the US-Mexico border, repeal DACA, attacks on reproductive rights through the Global Gag Rule, and an Executive Order moving forward with the Dakota Access and Keystone Pipelines, to name a few. The only way forward is collective action. 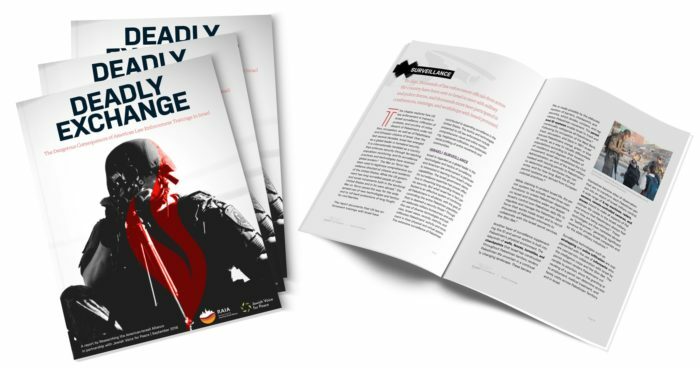 Visit our Resist page for Trump news, free posters and organizing trainings, and a map of local actions across the U.S.
Visit JVP’s Network Against Islamophobia and hold workshops using their latest anti-Islamophobia curriculum to become more knowledgeable, effective, and principled in your work confronting racism. Join our Rapid Response Network and you’ll get tangible ways to take immediate action. Download, print and distribute the “Refugees are Welcome Here” poster in your community. Get your “Stop Profiling Muslims” t-shirt or hoodie at JVP’s online store, buy a button, poster, or baby onesie with the same design, or download the free poster. Read more about the Syrian Refugee Crisis and bring those resources to your family and friends.